I did trim off the large section of fat that you see in the top right portion of the photo below. 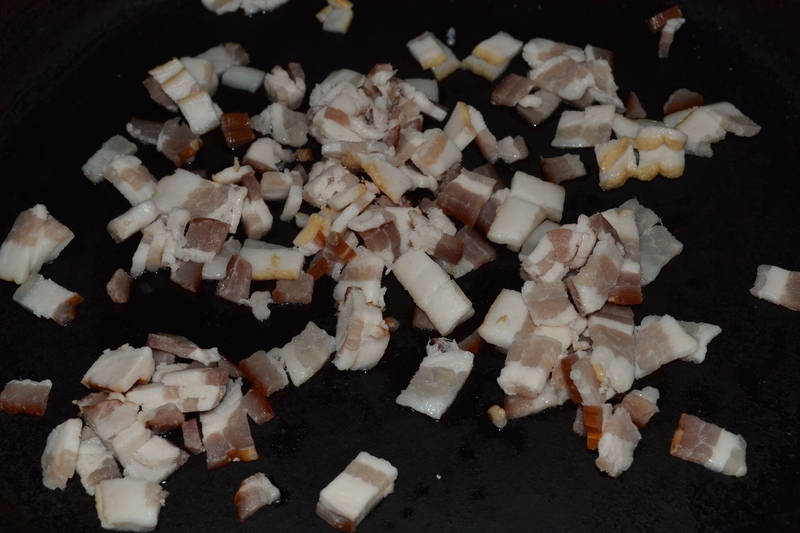 I think there was enough fat in the bacon I was dicing. As you can see I used 9 half slices of regular bacon. I diced the bacon up into small cubes and dropped them into a hot skillet. 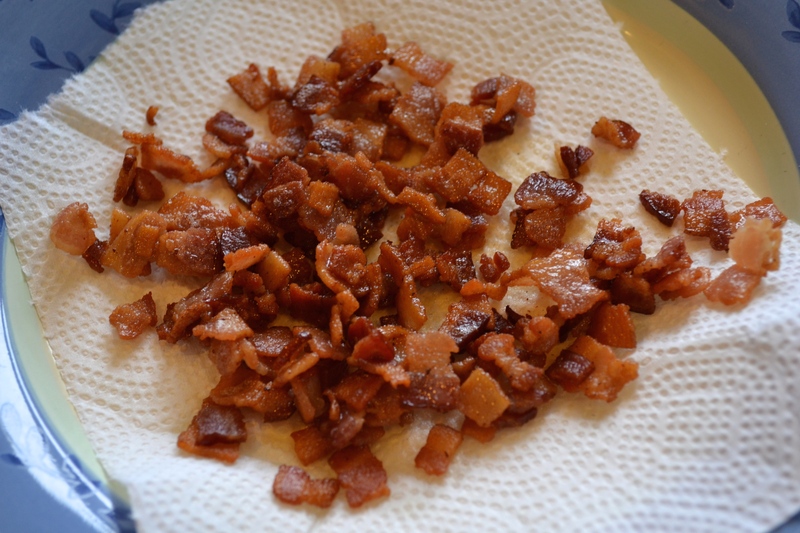 The bacon is crispy and fat is rendering out of it so it’s almost ready to remove from the pan. 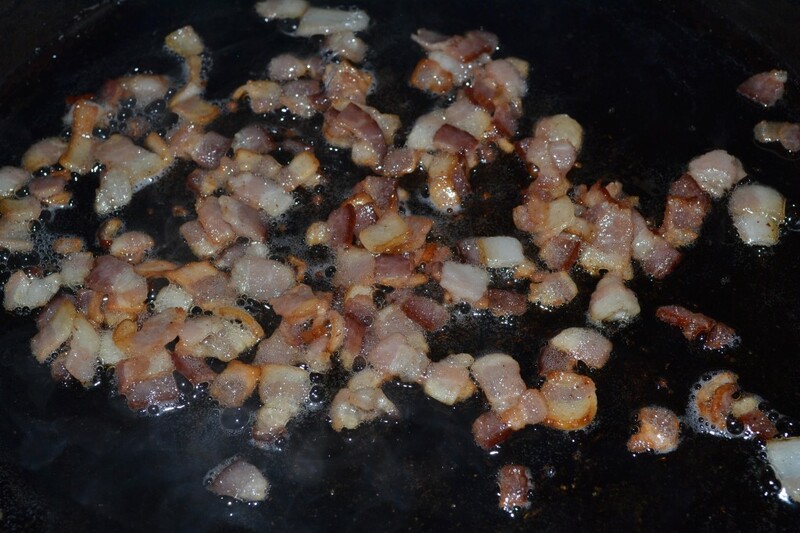 Bacon removed from skillet and set aside on paper towelling to drain and be used later. 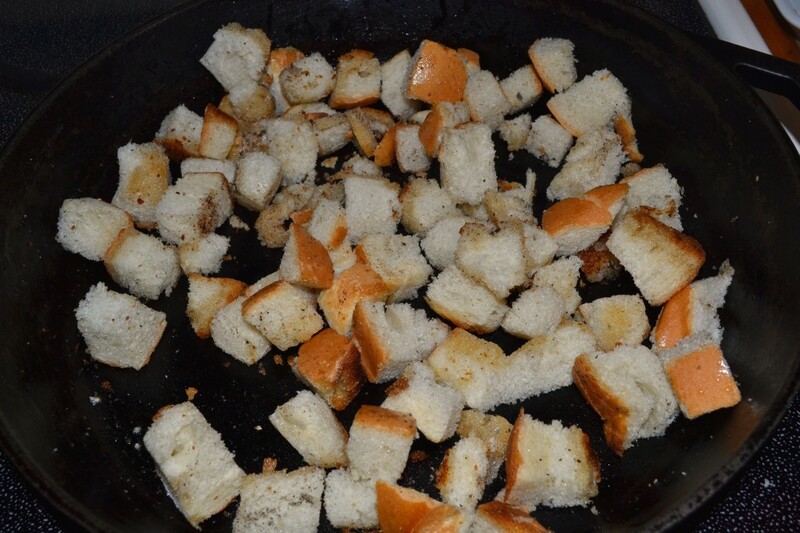 Next I start on the home-made croutons. 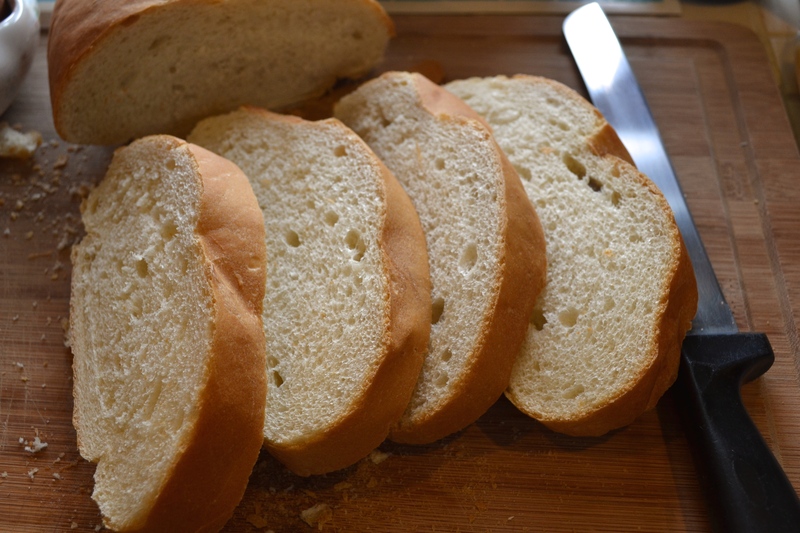 I begin with day old bread and cut off 4 pieces, about 3/4″ thick. 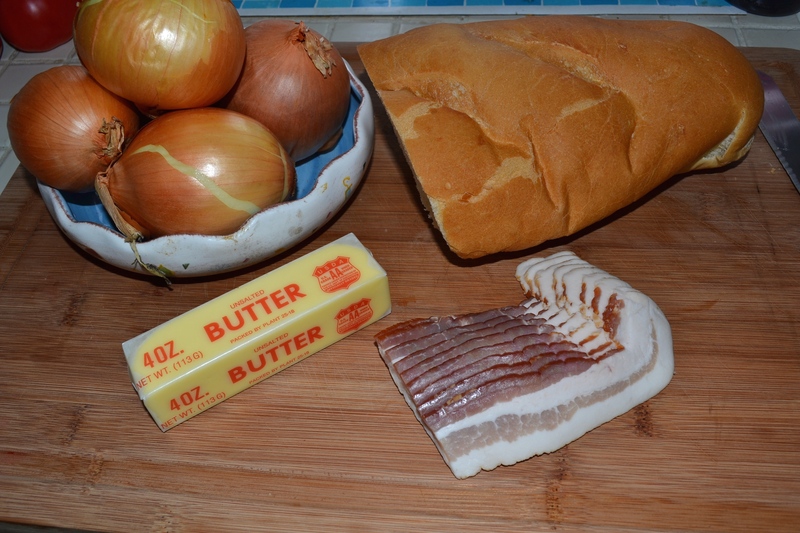 I dice these slices up and place them into my hot skillet with the bacon drippings. I toast the cubes, turning often, in the skillet until they are golden and crisp. 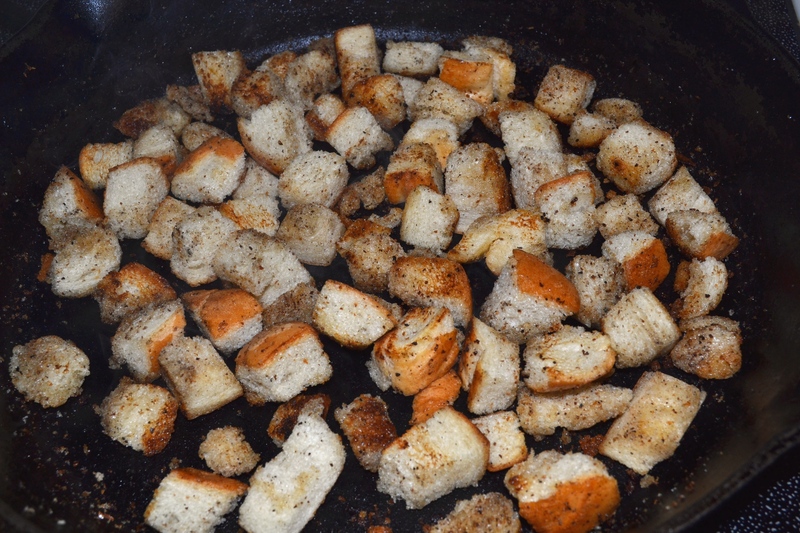 When the bread cubes are ready I remove them from the skillet and set them aside for use later. Then I begin on the soup itself. 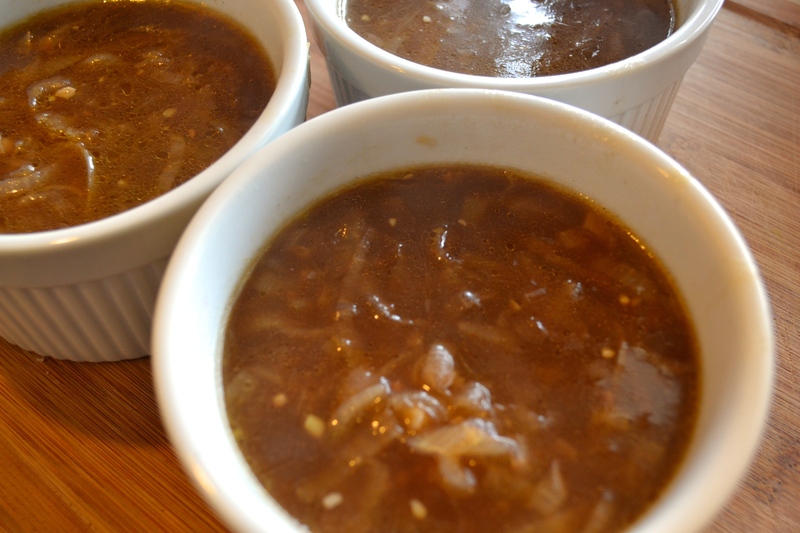 5 medium to large onions, 8 cups low sodium beef broth, 1 cup red wine, 1/2 tsp. hot sauce, freshly ground pepper, sliced swiss cheese, 2 tbsp. minced garlic, 1/2 stick butter, 4 tbsp. flour. 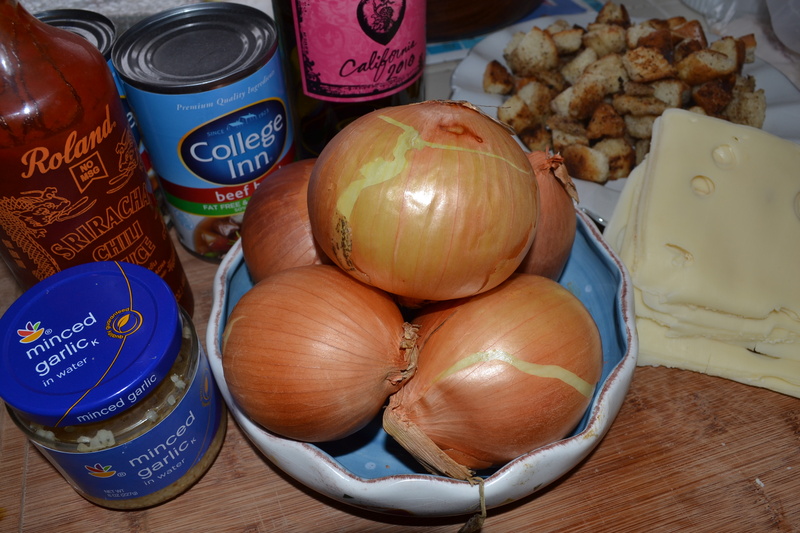 I start by slicing up the onions as thinly as possible. You will end up with a monster pile of onions. 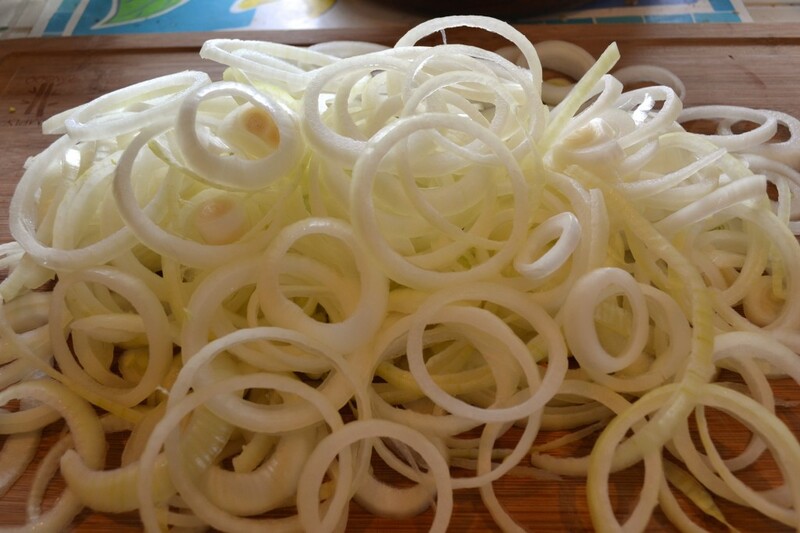 Note: I wear my reading glasses when I slice up my onions as it saves me the teary eyes you will have if you go at this with no eye protection. 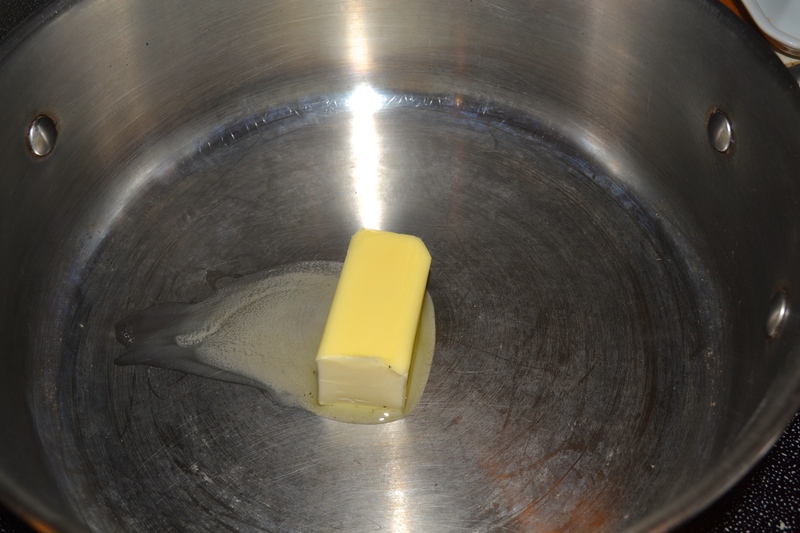 Next I heat up the soup pot and melt 1/2 stick of unsalted butter. 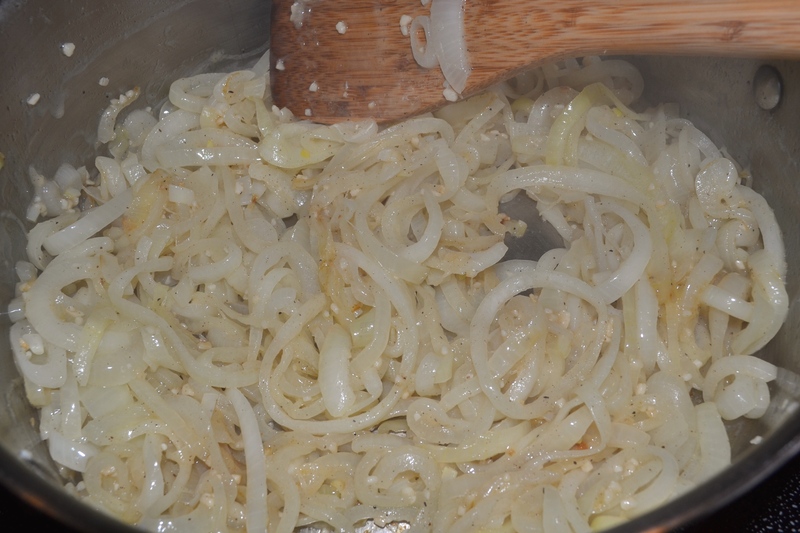 When the butter has melted and is bubbling I add the onions, 2 tbsp. garlic and freshly ground black pepper. You can add any additional seasonings your prefer as well. Now would be the time to add cumin or thyme, etc. I let the onions cook down on medium heat for 20-30 minutes. 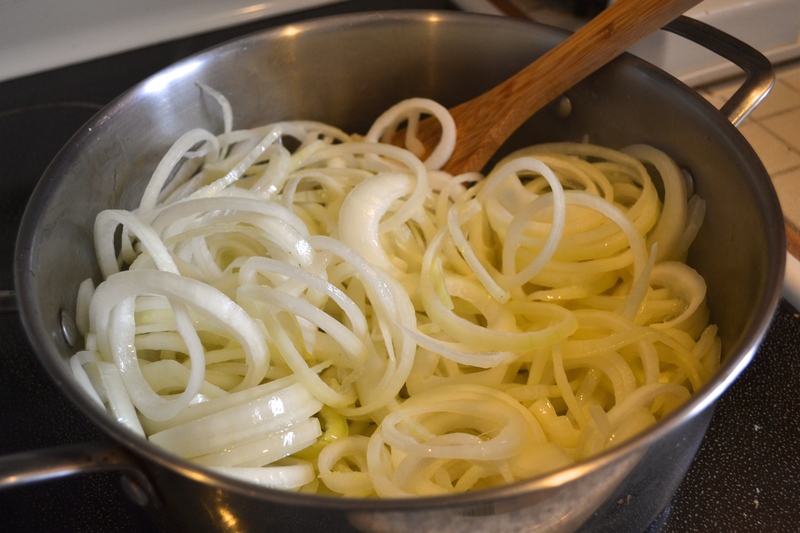 I turn the onions often as I am not looking to get any color on the onions, I only want them to soften slowly and cook down with the garlic. 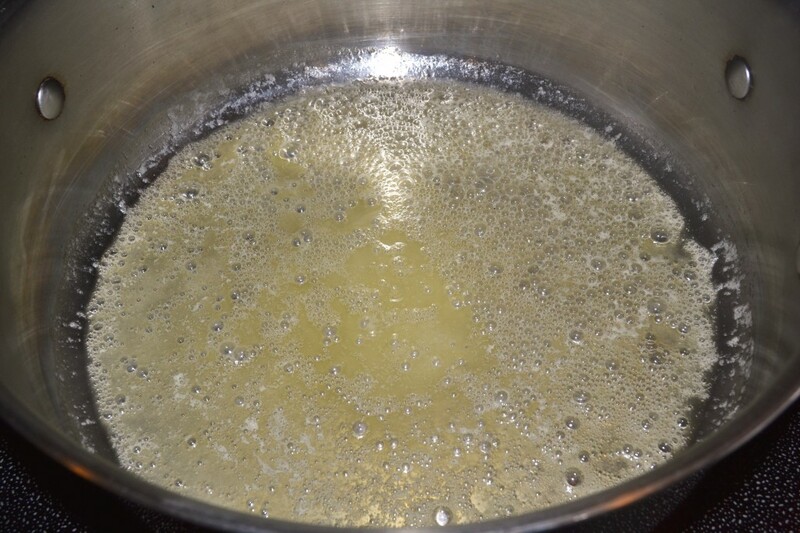 Add 1 cup of red wine to the pot and let this bubble away until the wine has reduced and the pot has almost no liquid in it. Then it is time to sprinkle 4 tbsp. 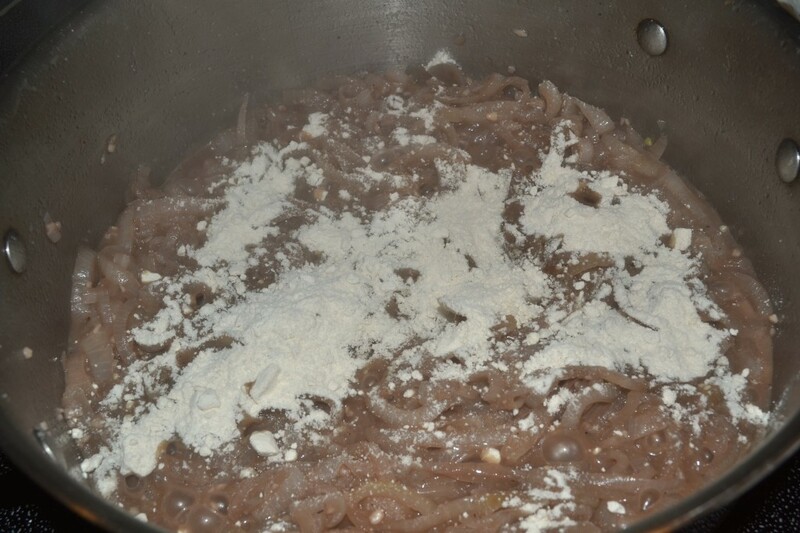 of regular flour all over the onions. Stir this up and let cook for another 5-10 minutes. You are letting the flour incorporate into the onions and cooking that raw taste out of the flour. Next add 8 cups of low sodium beef broth, bring soup up to a boil then turn down the heat and simmer, covered, for an additional 20 minutes. At this time I add a 1/2 tsp. of Sriracha hot sauce but you can leave this out if you don’t want any spice in your soup. My mom always adds Worcestershire sauce to her version but I have omitted it here as I did not have any in the pantry. 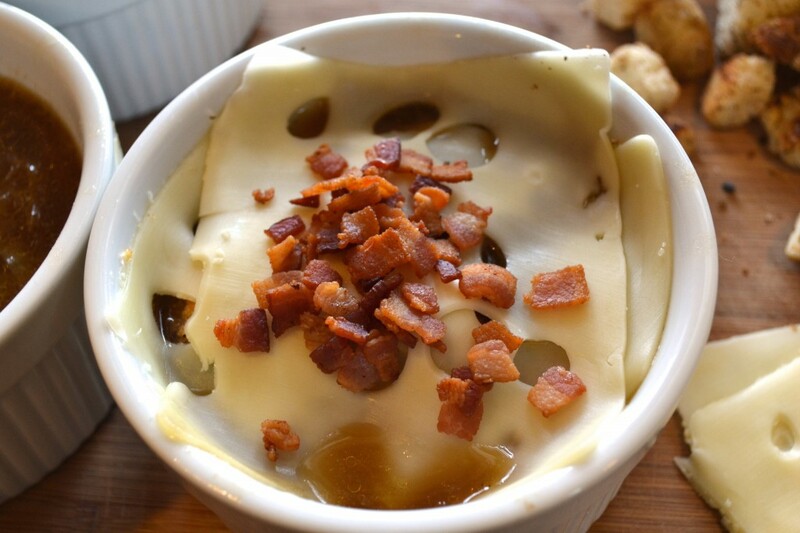 I set up my ramekins on the cutting board and ladle the onion soup into each, almost to the top rim of the ramekins. 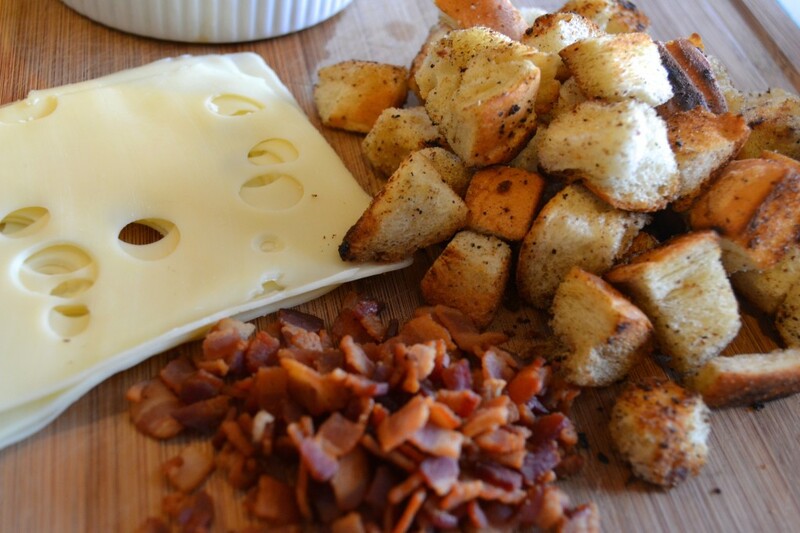 Now I add the finishing touches, sliced swiss cheese, home-made croutons and bacon bits. 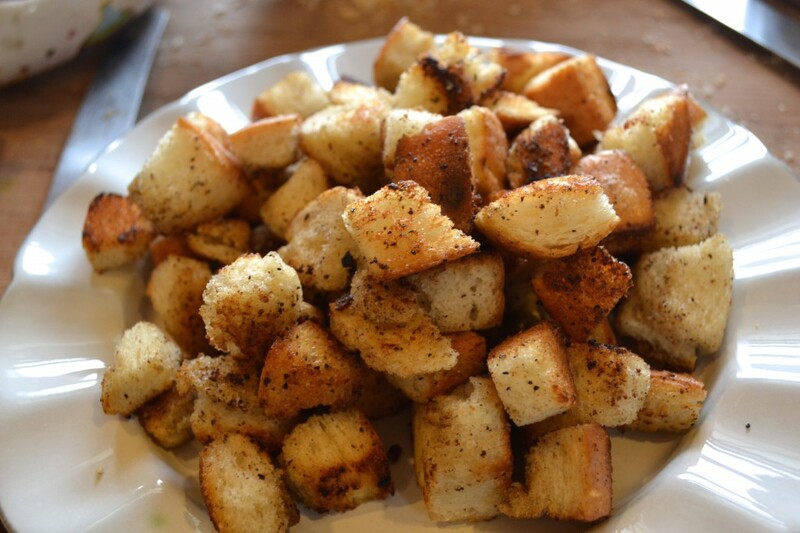 A handful of croutons go on first. 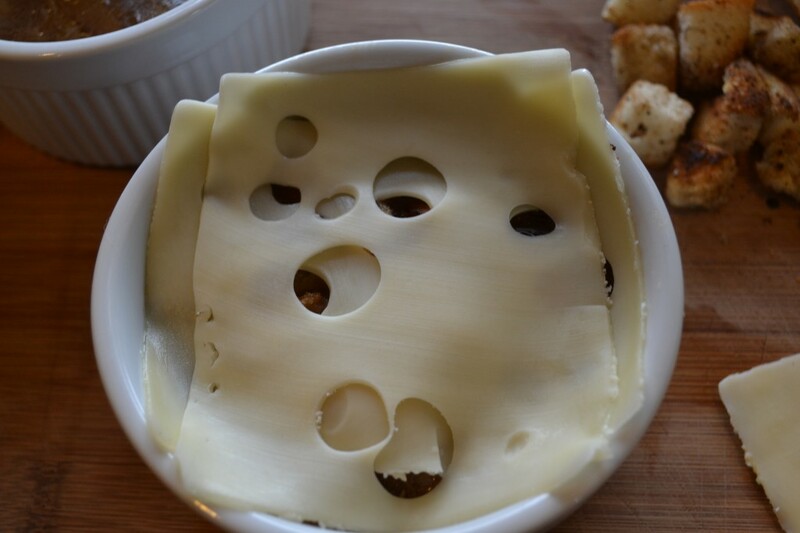 Then two slices of the swiss cheese on top and I tuck the cheese around the inner top of the ramekin. 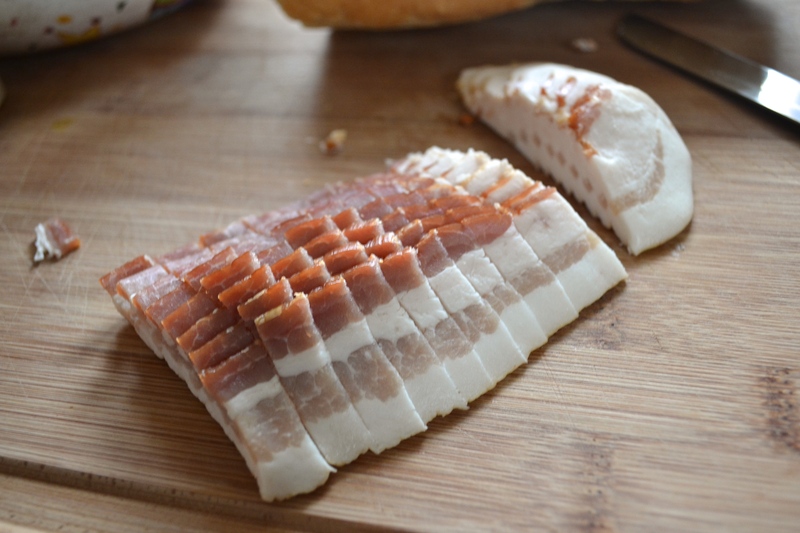 On top of the swiss cheese I sprinkle a few of the crispy, salty bacon bits. Delicious! Then into the oven, with the broiler going, for about 5 minutes so the cheese bubbles and melts. 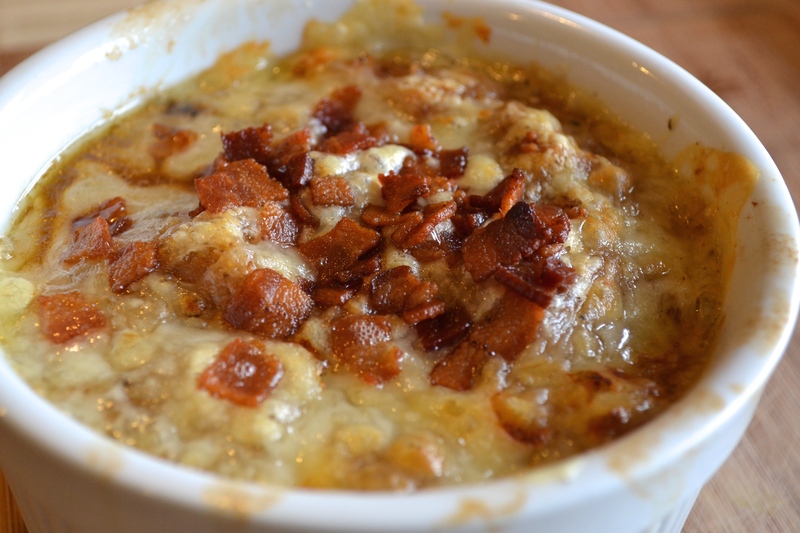 You need to watch the soup while it is under the broiler, the cheese and bacon bits can burn very quickly so now is not the time to leave the kitchen. This recipe makes 5 servings. *You many have noticed that I did not have salt listed as an ingredient in this recipe. 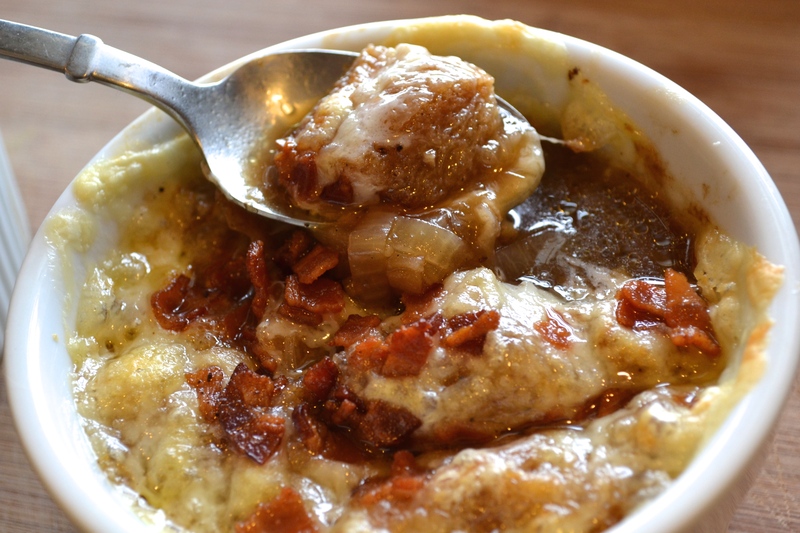 I add absolutely no additional salt to this dish as the bacon and swiss cheese have salt in them already as does the low sodium beef broth. I am constantly tasting the soup as I make it. 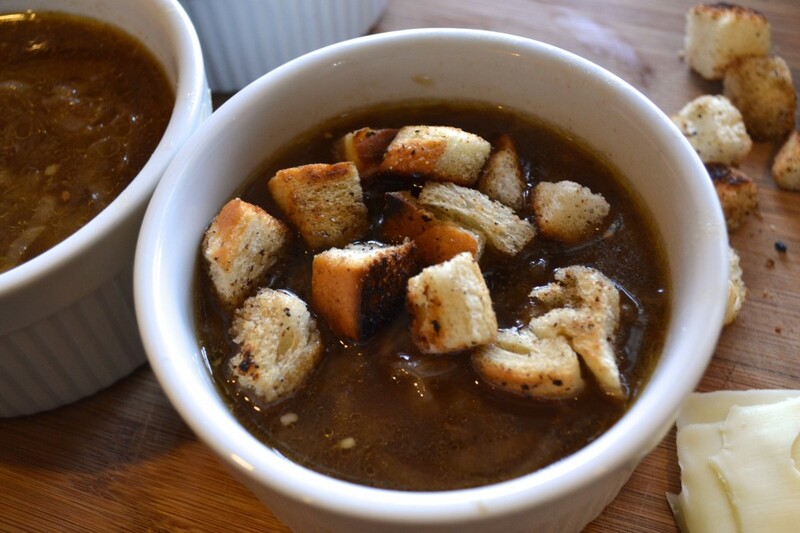 Once the red wine and beef broth have been added you should taste the broth and see if you feel it needs any additional salt. You can always add salt at the very end if you must but if you over salt the soup it is nearly impossible to cook it out and save the dish. 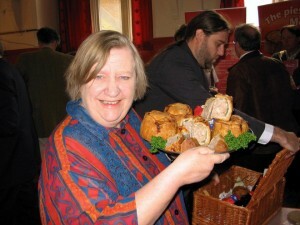 On a side note: Clarissa Dickson Wright was one half of the Two Fat Ladies…she passed away last week at the age of only 66. I thoroughly enjoyed watching the show and found both Clarissa and Jennifer very entertaining. Growing up my family lived in England for a short time as well as Australia for 5 years and so british food is a big part of my memories and childhood. My mom learned to make all kinds of wonderful british dishes like bubble & squeak, Cornish pasties, scones & clotted cream, scotch eggs, beef & ale pie…….the list goes on. Farewell to Ms. Wright, she (& Jennifer) were always fun to watch. May she rest in peace.